An illustrated research essay on a variety of costume designs that enable a performer to walk on all fours. This includes devices worn to make the reach of the performer's arms match the length of their legs. Safety concerns in designing and wearing quadrupedal costumes. Examples of performances in which foreleg extensions have been used: traditional and innovative, secular and spiritual. Illustrations: One page. I include my own hand-drawn illustrations of four of the more complex types of foreleg extensions. The copyrights of these designs, if any, belong to their respective designers. Rated G. This document is safe for work, family-friendly, and contains no content likely to offend children. Content warnings: This document includes brief mentions of injuries, dangerous stunts not to try at home, animal products (pelts), and altered states of consciousness. This document doesn't graphically describe any of these things. Author: Orion Scribner has interest in costume design, but has no experience designing or performing in costume, and therefore has no authority in this subject whatsoever. You may contact the author by e-mail. This means that you have permission to download, share, print, and translate this free e-book, so long as you credit Orion Scribner as the original author, and don't sell it. You can even modify this e-book, on the condition that you share it under identical terms. In some live performances where the story calls for the portrayal of a four-legged animal or monster, costume designers could consider an alternative to the two-person prop-horse costume. A quadrupedal creature can also be portrayed by a single performer. In order to walk on all fours, the structure of the costume must include foreleg extensions in order to equalize the difference between the lengths of the performer's arms and legs. Quadruped costumes have been used to represent animals and monsters on stage, on film, in religious ceremonies, and in parades. Their designers call these costumes "quadsuits" for short. Foreleg extensions have been made in a wide variety of different designs, each with their own advantages and drawbacks. Apparently everybody who makes a set of foreleg extensions comes up with their own unique pattern. It's not standardized at all. There are many possible variations on the structure of a foreleg extension, some of which would be safer or more comfortable than others, so I am curious about some of the designs and solutions that people have come up with. To improve this document in later versions, I'd like to hear from some designers or costumers who have had experience with foreleg extensions. Perhaps a designer who studies this document may someday produce an ideal foreleg extension design. Some designers call foreleg extensions "quadsuit stilts" instead. However, for the purpose of clarity in this document, I must distinguish between these terms. I use "foreleg stilts" only to refer to extensions of greater than necessary length, which give the performer much additional height. I use "foreleg extensions" only to refer to devices that only add the amount of length necessary to equalize the difference in length between the performer's arms and legs. I admit that I am not an expert in this topic, only a curious bystander. I have neither made nor worn any quadsuits. I haven't worn any foreleg extensions or stilts. I have done my best, but my descriptions may be too inaccurate for use. Gentle reader, if my document inspires you to buy, make, wear, or sell quadsuits or foreleg extensions, then you take full responsibility for your own actions. If you try any of these things, then you try them at your own risk. Take caution. Having said this, I've done a fair amount of research on this subject. I applied some common sense to judging which designs are more efficient, safe, and comfortable. In general, I expect that the most ergonomic designs are those in which the wearer holds their wrist straight, with palm facing to the back. I hope this advice will be helpful to a designer or costumer somewhere, even though it does not come from my personal experience. I have organized the following sections from simplest to most complex. I begin by summarizing a variety of designs for foreleg extensions that are staff-like and unarticulated, crutch-like and articulated, pipe-like and articulated, and then a few more peculiar foreleg extension designs. I follow this with some common-sense advice (not from my personal experience) on safety and comfort, mask design, and some impressive examples of full quadsuit costumes. Similar to forearm crutches, but designed on different principles, people can hike with a pair of "trekking poles." They're meant to assist the hiker's balance when crossing uncertain terrain, particularly snow and streams. They also increase the hiker's endurance by distributing some of his or her weight off of his or her legs. A trekking pole is basically a single straight shaft. Unlike a forearm crutch, a trekking pole has a straight handle. A hiker stands upright, and holds a trekking pole with his or her elbows bent, wrists straight, and palms facing inward. Trekking poles come with a variety of features, including a retractable shaft, lightweight materials, and/or shock absorption via internal springs. Trekking poles wouldn't be useful for creating a lifelike animal costume, because they make a silhouette unlike that of an animal. However, similar staves have been used to create animal-like performances. The posture for using trekking poles resembles that of the "dance with two sticks" practiced by the San (Bushmen) peoples of several southern African countries. In trance-dances, medicine dancers hold a simple staff in each hand to support their upper body as they lean forward. With these staves, they imitate the forelegs of the animal spirit that they invoke in the ritual. By leaning slightly forward on these "forelegs," the dancer compromises between human and animal physiology. The staves also help the San dancers keep their balance while in trance. Standing up in that altered state becomes challenging because they experience tactile hallucinations and distorted proprioception (sense of body position and shape). In interviews, trance-dancers claim they feel and see themselves transforming into animals. Cause and effect are unclear here, but the trance-dancers may experience these particular types of transforming sensations because of their bent-forward stance. Psychological anthropologist Felicitas D. Goodman found that certain postures tend to induce certain types of trance experiences. Goodman argues that many traditional rituals use these postures intentionally to accomplish the appropriate type of trance experience. The trance-dance is related to why ancient San rock art frequently depicts men and women in various phases of transforming into animals. San rock art is among the most ancient representational artwork in the world. The age can only be estimated, because carbon-dating doesn't work on mineral pigments. Some of the rock art shows stick-dancers wearing antelope masks or costumes, a long-lost part of the tradition of dancing with two sticks. Some foreleg extensions are made out of crutches that have been taken apart and reassembled in a new way. For example, the wooden pair shown in fig. 2 in this document, as demonstrated in a video by Paw And Claw Production. These do not have articulation. A wolf quadsuit in the San Francisco Lyric Opera's production of Mozart's The Magic Flute had foreleg extensions made from modified aluminum crutches. 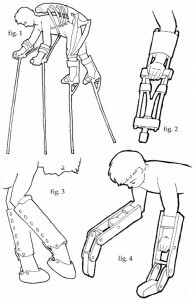 Rosalyn Greene included sketches of three different crutch-like designs for foreleg extensions in her book The Magic of Shapeshifting. This is where I first heard of foreleg extensions, and inspired me to research the design potential of this type of prosthesis. The designs in Greene's book are practical, but could use improvement. Two of the designs look to me as if they would quickly become uncomfortable, due to having one's wrist turned at an angle, or due to supporting one's weight on a crutch-pad in the armpit. One of the three designs presented by Greene does look very successful. It resembles a commercial foreleg extension that was formerly manufactured by Stiltwerks™ Inc., called ARM Peg Stilts. These resemble a tuning fork with tines upward. The wearer's forearm inserts between the tines, and fastens in place with a cuff. Many other designs for foreleg extensions involve inserting one's forearms into large PVC pipes, with crossbars inside for handles. They get hot and sweaty inside. Ideally, they have vents. Some even have fans installed in the paws to blow cool air at the wearer's hands. Arichelic built a pair of foreleg extensions out of PVC pipes, with articulations where the animal's wrists should be. Arichelic shares a video tutorial for how to make them. The joints have bands of elastic hot-glued onto the back side, so that they don't move stiffly. See fig. 3 in this document. Inspired by the PVC pipe design, Thoron Wild built a wooden pair, also articulated where the animal's wrists should be. See fig. 4 in this document. Instead of using straps, the wooden frame forms a box around part of the wearer's forearm. The wearer's wrist is held straight (with the palm facing back) while gripping a handle that is a cross-bar inside the frame of the foreleg extension. The designer says that these foreleg extensions are "easier to walk in than PVC pipes but much harder to make. But there are the drawbacks… heavy … noisy too." Poprock Grey came up with a design combining the best traits of both Arichelic's and Thoron Wild's designs, and posted	a description and some instructions. Instead of inserting one's whole forearm into a large PVC pipe, a pair of much narrower PVC pipes flank the wearer's forearm instead. Only a cuff of PVC pipe encircles the upper arm. The designer notes an advantage: "These have nothing to rub your knuckles on." As with the above two designs, the wearer grips an inner crossbar as a handle. A wider PVC pipe is articulated onto the end for the paw. Although I judge without having tried wearing any of these, I like this one best for the efficiency of its design. Some foreleg extensions are designed with other purposes in mind. They don't just equalize the length of legs and arms, doing the minimum necessary to make it possible to walk on all fours. Some extensions create a completely different silhouette, or they are not intended to take the wearer's weight. The Deerleg Dance (representing the stumbling of a newborn fawn) in the stage performance	Cuckoo Crow by the Degenerate Art Ensemble uses a different style of foreleg extension. The dancer wears extensions that fasten on her forearms, with the wrist held straight (and the palms facing inward) while gripping a handle that might be a loop or crossbar on the inner edge of the foreleg extension. These extensions have articulated knees, but don't appear to be designed to take weight. The way that the dancer uses these extensions more closely resemble the aforementioned San tradition of dancing with two sticks. Performers who become proficient at walking on stilts (on two legs) sometimes combine these with extremely long foreleg stilts, so they can stilt-walk on all fours. These four long legs create a giraffe-like figure. In fact, quadruped stilt-walker costumes were used to portray giraffes in the Broadway production of Disney's The Lion King. Quadrupedal stilts were also used to create the effect of alien animals called "Landstriders" in Jim Henson's fantasy film The	Dark Crystal (1982). The foreleg stilts resemble the aforementioned medical forearm crutches. The inner structure of the costume included tubing and foam supports to simulate the bones and muscles of a body shape unlike that of a human. Since a fall could break a performer's neck, the performers wore safety harnesses tethered to a crane overhead. With this precaution in place, the Landstriders did several impressive stunts: galloping at high speed, rearing, kicking. In one test video, the Landstrider leaped approximately twenty feet across the floor before his hooves touched the ground again. Another quadrupedal stilt-walker, Steve S., concurs that experts can perform marvelous stunts: "the real fun comes when you add arms. With long arms, running, jumping and skipping as a four legged creature is possible. I can move very fast and cover a great distance in no time at all." With this fun comes increased risk of falling from a great height. 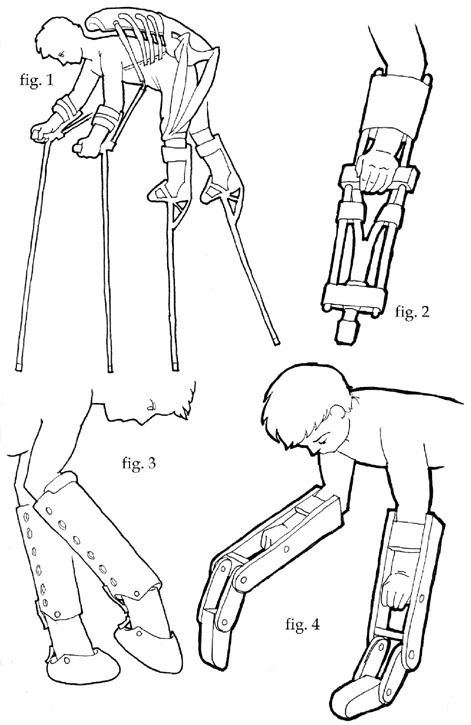 The reader should keep in mind that stilt-walking is a dangerous stunt, whether on two legs or four. Even if a performer is completely confident in his or her own skills as a stilt-walker, he still has to count on other people to use his space responsibly! That's not something to count on at parades or other informal events where the performer is surrounded by people who have made no agreement to watch out for the performer's safety. Bystanders will accidentally back into or bump stilt-walkers before they notice that they're in someone's space. Sometimes, a reckless bystander will even deliberately harass or endanger a stilt-walker. For example, a group of quadrupedal stilt-walkers (costumed as robots) marched in a Fremont Solstice Parade a few years ago. A bystander in the crowd rushed out into the street and tackled the legs of a stilt-walker, shouting "Robot attack!" The stilt-walker fell perhaps twenty feet, and was knocked unconscious. The assailant fled and disappeared into the crowd. I don't know what happened after that, but I hope the performer was all right. I haven't found any news articles, blog posts, or YouTube videos mentioning this event or its outcome. What was the bystander thinking? Presumably, the bystander acted on a whimsical impulse, and hadn't considered that it would be dangerous to tackle a stilt-walker. This shows that bystanders can act foolishly enough to hurt a stilt-walker. A stilt-walker should not trust in his or her own skill alone as a way to stay safe. "I slipped on the liquid Nitrogen fog that had frozen on the stage. I went down with a thump. I was able to control the fall even though my arms had stilts … After, the other performers had to drag me off stage during the finale because I couldn't get up. A couple of torn muscles and possibly a cracked rib were all I suffered." Somebody hadn't realized that the picturesque fog would cause problems for the performers. Another aspect of safety is that one's stilts must be well-made enough to be reliable. That can mean investing in making them from aluminum. Some	quadrupedal stilt-walking sets are commercially available. The aforementioned Stiltwerks™ currently sells a quadrupedal set called Jaywalkers. Let us return to discussing the relatively short foreleg extensions, as before. Even if you're close to the ground when you're on all fours, don't expect that you can immediately run around without getting injured. Greene warns that when you're using foreleg extensions, "if you slip at high speed [you'll...] end up plowing your face into the ground!" Furthermore, since your arms are strapped into foreleg extensions, you can't quickly put out a hand to stop your fall in the way that you normally would. If you try anything too acrobatic in this activity, likely injuries include face-plants, neck injuries, and broken arms. How you fall when you're already on all fours is different from how you fall when you're walking on two legs, and the ways to catch yourself are different, too. When starting out with your foreleg extensions, you would also be wise to practice falling on purpose, as people do in martial arts classes, so that you can get used to ways to catch yourself. Through practicing these safe falls a lot of times, you can integrate these movements into your muscle memory, so that you'll save yourself from a bad fall before you can even think of it. Beginners who are practicing with foreleg extensions-and who really want to be able to run fast or do other acrobatic stunts on all fours-would be wise to wear safety gear, just as they would have the prudence to wear safety gear when first learning how to use in-line skates. (You know you're supposed to wear safety gear even if you're an expert at skating...) You can use a set of ordinary sports supplies, easy to obtain, much as people complain about having to wear them. To protect against face-plants, wear an American football helmet with a face mask, ideally of the "nose, jaw, and oral protection" (NJOP) style, which covers the most. A helmet won't protect you from hurting your neck when you land on your face, but at least you'll still have your teeth. You might wear a set of knee-pads and elbow pads, too. If your foreleg extensions are going to be part of a full costume, then you can integrate this safety gear into your costume design. See the helmet and pads as ideal anchoring sites for costume elements. Participants in a discussion thread on a quadsuit community recommend wearing gloves with the foreleg extensions, such as biking gloves or weight gloves. You can further customize gloves by this method, suggested by Lironess of the Quadsuits community on LiveJournal.com: "cut apart a gel insole for shoes and glue it inside for even more padding." Padded gloves should provide some comfort when using your hands like feet. Posture on all fours won't come naturally to us bipeds. Beastcub Creations offers advice about the correct posture to use while on all fours: "Back [needs to be] fairly flat, angled up a little so you are comfortable, head is above your hip. Angled down from hip is very UNcomfortable." Designers and performers should take this into consideration. If you design a quadsuit with an animal mask, consider safety and comfort in this aspect, too. A heavy mask feels relatively acceptable when you stand upright on two legs, because you hold your head over your shoulders. In that position, your neck can passively support the weight, as if you were a caryatid (a human-shaped support column). However, when you're standing on all fours, you hold your head in front of your shoulders, and your neck has to work harder to hold up your head. Even without something heavy on your head, your neck tires quickly in this position. If you're going to wear a mask on or above your head, then the weight of that mask should not rest directly on your head or neck. In my opinion, the ideal solution would be something like this: you may be able to come up with a way to design internal support structures in the costume so that the mask's weight is supported by its own "neck" that stands up on a back harness. The mask would hang suspended above your head, but your head wouldn't be taking the weight. Look into lightweight materials such as foam. Make the mask hollow wherever it can bear it. You might also build it like it's a lantern, with a thin "skin" stretched over a bamboo or wire skeleton. That aesthetic is different from most furry costumes, but it worked well for the multi-person wearable puppets in War Horse, designed by the Handspring Puppet Company, and demonstrated in this video. As an added benefit, maybe you'll be able to see and breathe while you're wearing a quadsuit made out of those materials. Papier-mâché, clay, and wood are too heavy for nearly any costume part. Reconciling the anatomy of a biped with the stance of a quadruped creates a problem. When on all fours, a human can't gaze entirely straight forward. A quadrupedal animal carries its head in a position that a human cannot imitate. If the goal of the costume is to look like a realistic animal, or at least to cut the silhouette of one, then the mask cannot align with the performer's face. If the animal in question should have a short neck, then the performer will wear a mask nearly on the top of his or her head. If the animal has a long neck, then the mask stands high above the back of the performer's head. This creates a challenge for the performer. If the performer ignores the mask position, then the animal's head will seem lifeless and empty, ruining the effect. The performer must adapt her body language so that it seems that his or her eyes are up there on the mask, rather than where they really are. When the choreography calls for the animal to gaze at an object, then the performer should angle her head so that the mask's eyes point at the object. The performer has to focus her consciousness upon the mask as if it was her real face. As such, performing in a quadsuit involves some elements of puppetry. Although full costume quadsuits are more often cartoonish, stylized, or whimsical, they can also be made to be impressively lifelike. Let's look at some examples. The performer brings the saber-toothed cat to life under difficult conditions. One must keep in mind that most full animal costumes are difficult or even grueling to perform in. Beastcub Creations created a bear quadsuit with an accurately bear-shaped silhouette. Human proportions reconcile most easily with those of bears and hyenas than any other animals. A human in a wolf costume inevitably makes for an oddly-proportioned wolf, with a shorter waist and longer, thicker legs. Nonetheless, Japanese fursuiter RadyWolf's quadsuit is realistic, a wolf with detailed toes and head. The lion by Primal Visions Design Studio is also impressively realistic, with a complex artificial pelt. Both of these could nearly pass for real animals, so long as the performer's position and behavior disguises the odd proportions. If you are interested in making a full quadsuit costume, or having one made for you: costume designer	Beastcub Creations includes instructions for how to make a "duct-tape dummy" (dress-form) for a quadsuit. To assume the correct position for making a duct-tape dummy in this case involves resting one's bare hands on a stack of books or a chair, to make up for the difference in leg length. In all other regards, quadsuit costume design has much in common with the design of bipedal costumes. We have seen that costume designers have developed a wide variety of foreleg extensions: articulated or unarticulated, and made out of staves, crutches, PVC pipes, or other materials. Performers have worn these costumes to recreate extinct animals, to invent alien creatures, to invoke animal spirits, to transform themselves, and to tell stories. Foreleg extensions have been used just for the fun of it, for practicality's sake when hiking and trancing, and for religious rituals. Beyond that, quadrupedal costumes have much unexplored design potential. There is much yet to be shared about personal experiences, safety and comfort advice, more efficient foreleg extension designs, and more elaborate costume designs. Could foreleg extensions someday be used for all-new activities in sports, acrobatic dances, live theater…? No matter what, though, please keep safety precautions in mind. Gentle reader, I hope this inspires you to try something new, and to take proper caution if you do. I, Orion Scribner, drew the page of illustrations in the year 2011, based on videos produced by other designers. The copyrights to these foreleg extension designs, if any, belong to their respective designers. I hope that I have not offended any of these designers by producing these illustrations in my attempt to better appreciate their designs. Fig. 1. The interior of a Landstrider from Jim Henson's The Dark Crystal. Drawn after the documentary "The Making of The Dark Crystal" (1982) at 23 minutes and 35 seconds to 24 minutes to 36 seconds. Caution: This is an approximate sketch, not a schematic. Fig. 2. Front view of a crutch-based foreleg extension made by Paw And Claw Productions. Fig. 3. Side view of PVC pipe foreleg extensions made by Arichelic. Fig. 4. Front view of wooden foreleg extensions made by Thoron Wild. English-language anthropological literature formerly referred to the San as "Bushmen." Currently, the San themselves disagree about which term is preferable, because both terms have pejorative connotations. The San have officially agreed to permit the term "San" to refer to them. Pieter Jolly, "Dancing with two sticks: Investigating the origin of a Southern African rite." The South African Archaeological Bulletin 61:184 (2006), p. 172-180. Felicitas D. Goodman, "A trance dance with masks: Research and performance at the Cuyamungue Institute." TDR 34:1 (1990), p. 103. Pieter Jolly, "Therianthropes in San rock art," The South African Archaeological Bulletin, 57:176 (2002), p. 91. Pieter Jolly, "Dancing with two sticks: Investigating the origin of a Southern African rite." The South African Archaeological Bulletin 61:184 (2006), p. 179. Laughinghyena, "Lions." Quadsuits. 2007-06-07.	http://quadsuits.livejournal.com/346.html CAUTION: do not click on the link to the wiki in that post. It no longer goes to a wiki. The web address was taken over by a different site. You can view the wiki page through Archive.org, but the archive doesn't retain any pictures of the costume in question. Rosalyn Greene, The Magic of Shapeshifting (Boston, MA: Weiser, 2000) p. 220. These are plastic pipes available at hardware stores. PVC stands for polyvinyl chloride, the type of plastic used. Taymor, Julie, and Alexis Greene, The Lion King: Pride Rock on Broadway (New York: Hyperion, 1997). This was captured on video and broadcast on a local public-access channel. That's where I saw it. Unfortunately, I'm not able to come up with real citation information about it. I think it may have happened in 2006. The Fremont Parade Blog at	http://facbull.blogspot.com doesn't mention anything about it. Goodman, Felicitas D. "A trance dance with masks: Research and performance at the Cuyamungue Institute." TDR 34:1 (1990), p. 103. Greene, Rosalyn. The Magic of Shapeshifting. Boston, MA: Weiser, 2000. Jolly, Pieter. "Dancing with two sticks: Investigating the origin of a Southern African rite." The South African Archaeological Bulletin 61:184 (2006), p. 172-180. Jolly, Pieter. "Therianthropes in San rock art," The South African Archaeological Bulletin, 57:176 (2002), p. 91. Laughinghyena, "Lions." Quadsuits. 2007-06-07. http://quadsuits.livejournal.com/346.html CAUTION: do not click on the link to the wiki in that post. It no longer goes to a wiki. The web address was taken over by a different site. "Making of The Dark Crystal, the." 1982. The World of Jim Henson.